‘Tis the season to celebrate everything winter. Is the snow falling where you are? Not yet for us. Despite that, I’m celebrating everything snow by bring to you a blog experience filled with snowman ideas. If you’re a regular, you probably already know that my daughter’s class party theme was snowman. This snowman cake was part of the party experience. We also made these cute paper plate snowman masks for the kids to take home. I took a lazy way out because I didn’t want to add another craft to my preparations for the party, so I and bought this Accordion Snowman Craft Kit that turned out super cute (affiliate). If you are here looking for snowman ideas, you have come to the right place. 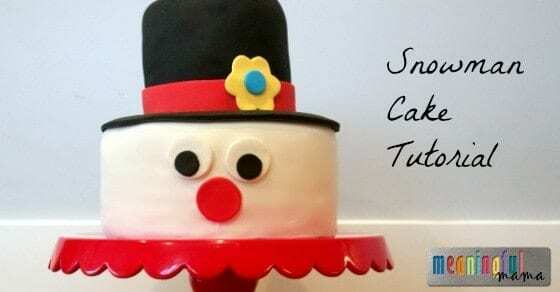 I do not just have a snowman cake, but I have all kinds of ideas to share. Here are a list of a number of the activities on my blog: Snowman Snowflake Craft, Egg Carton Snowman, Pointillism Snowman, Snowman Cupcakes, Snowman Hot Chocolate, Snowman Marshmallow Dispenser, and Sponge Stamped Snowman Craft. Maybe you are not here for snowmen. Maybe you are here because you love or are interested in exploring cake decorating. You have come to the right place too. Cakes are just a hobby of mine, but if you visit my cake tab you will see how much fun I have doing them. It’s one of those hobbies that I get lost in. You know you’ve found something you love if you forget to eat while doing it…at least that’s me. If you are interested in learning more about cakes, you might enjoy my Cake Making 101 and Cake Making 201 posts. I encourage you to use the search bar on my site for my favorite cake recipes. For this cake, I made my amazing White Velvet Cake and the Best Buttercream Frosting. I made a 8″ cake and a 6″ cake. I did three layers on each, so I had to make 2x my white velvet cake recipe. I used Satin Ice Rolled Fondant Icing – White/Vanilla. I will be doing a fondant review soon since I have about 5 fondant experiences under my belt by now. I’ll also be bringing you my homemade recipe soon. Cut out the eyes and nose using a circle cookie cutter set. 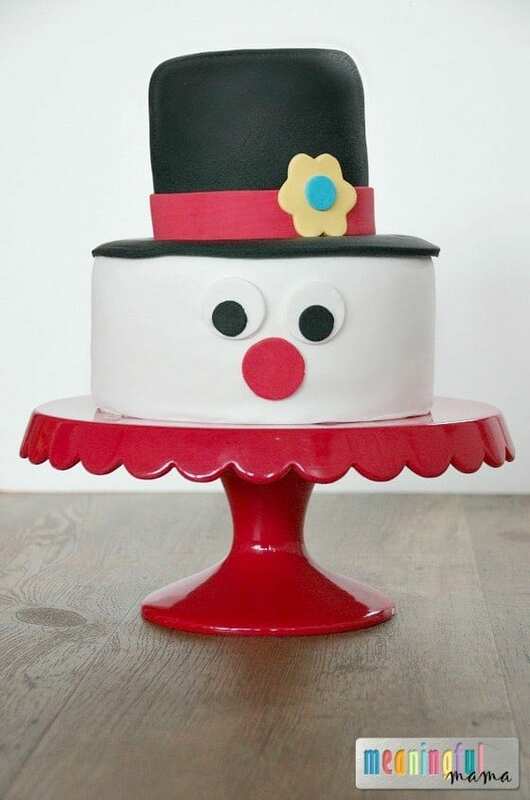 The nose and hat ribbon were made from red fondant . I like to buy pre-colored. I also like to use my fondant rolling pin with silicone guides so that I can get my fondant easily rolled out even and my kids can help. Roll out black fondant to a 8″ inch circle plus a bit more. I wouldn’t try and make black fondant. It’s virtually impossible to go from white to black. For the rim of the hat I took my 8″ cake pan , turned it upside down and cut around the edge using a pizza cutter . I stuck this black fondant circle centered on top. I covered the 6″ cake with black fondant. I used a ruler to cut out my red ribbon strip from the red fondant. You could also use a fondant strip cutter . Attach it around the edge. I used a flower cookie cutters to cut the flower and the circle cookie cutters for the center. Fondant decorations are attached with a tiny bit of water on a clean paint brush. I hope you enjoy the look of my cute but simple snowman cake. Let it snow, let it snow, let it snow!